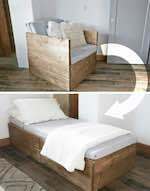 Twin Sleeper Chair free plan. Outdoor Chairs free building instructions. Save money and build your own outdoor chairs. At the link are the free woodworking plans with instructions to complete the project. Modern Outdoor Chairs free building plan. At the link you will find the free plans and instructions to build these modern outdoor chairs. Perfect for your patio or deck.